You can see list of our Compare Vitamagic Pro VS Vitamagic Roy below, perform Side-by-Side comparison. If you need further help, do have a look at Conzumr Guides and Tips. Alternatively you can view all Refrigerator to choose your own favourites. 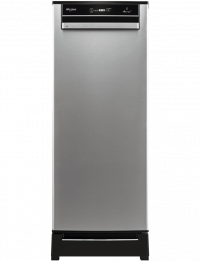 This refrigerator is powered by revolutionary 6th Sense VITAMAGIC Technology, that preserves Vitamins for 40% longer duration in your vegetables. Whirlpool Patented technology Zeolite helps absorbs the Ethylene gas released by vegetables and fruits preventing excessive ripening and keeping your vegetables and fruits fresh for a longer time. This refrigerator contains special Activated Carbon which removes odour from your Crisper and ensure fresh smelling vegetables. The Vacation Mode(Eco mode) ensures electricity savings up to 10% while Cooling. This refrigerator is powered by revolutionary 6th Sense VITAMAGIC Technology, that preserves Vitamins for 40% longer duration in your vegetables. Whirlpool Patented technology Zeolite helps absorbs the Ethylene gas released by vegetables and fruits preventing excessive ripening and keeping your vegetables and fruits fresh for a longer time. 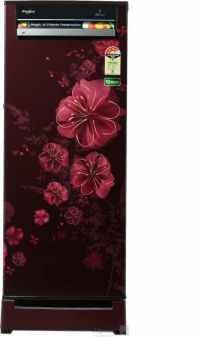 This refrigerator contains special Activated Carbon which removes odour from your Crisper and ensure fresh smelling vegetables. To Recieve updates and possible rewards for Whirlpool 230 Vitamagic Roy 4S Wine Dahlia (215 LTR) please sign in. To Recieve updates and possible rewards for Refrigerator please sign in.